Setting up XAcars is quite ease. Enter the settings dialog by clicking on "XAcars settings" first - you will see the dialog shown below (without the numbers which are only added for this documentation). The first three things you should enter (if not already done by the installer) are the URLs for the testsystem. For this, please enter the URLs shown into 1, 2 and 3. 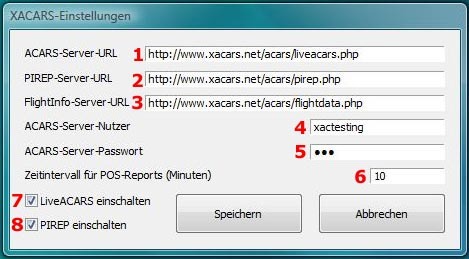 After that you have to enter your logindata which is "xactesting" for the user and "xactestingpass" for the passwort. Please enter those strings into 4 and 5. 6 is the time interval in minutes for position reports, which should be 10 for the testsystem. Most virtual airlines have different company procedures so that a time interval between 2 and 5 minutes is common. A higher interval needs less perfomance on the server (if there are many pilots) - a lower interval can track very short flightpath changes like SIDs. 7 is used for users which want to fly offline and send their PIREP later (maybe on another computer). With this option you can disable periodically sent ACARS messages (position reports). 8 is an option to disable automatic PIREP sending after your flight has finished. Use this, if you want full control over your PIREPs, but even with this option enabled you get a question if you want to send your PIREP. If this option is disabled you have to click on "Send PIREP" to send your PIREP.